Texas Woman’s University (TWU) has selected Balfour Beatty Campus Solutions, a leading developer and operator of infrastructure projects for the college and university market, to develop a new student housing community for the university as part of a public-private partnership. Opening in Fall 2019, the sophomore village will house 875 students and contain classroom, fitness, exploratory learning and recreation space. Texas-based Hill & Wilkinson will lead the project’s design/build team, in collaboration with project architect Stantec. 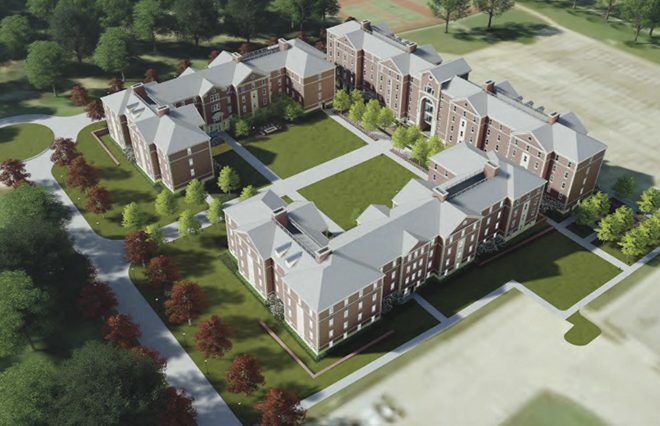 Located on TWU’s campus in Denton, Texas, the Residential Village Project will include three 4- and 5-story Georgian buildings featuring pod-style living quarters with small-scale communal baths with private bathroom and shower stalls. The project will incorporate residential amenities such as lounge spaces, study areas and community gathering places focused on the sophomore experience. The development also will include approximately 30,000 square feet of residential dining space to serve all of TWU’s on-campus student population, as well as Residence Life offices. Ricca Design Studios will lead the culinary design efforts. Structured as a public-private partnership, Collegiate Housing Foundation, a national non-profit entity, will serve as the residential facility owner through the issuance of project-based, tax exempt debt financing. Project negotiations and planning will continue with Balfour Beatty Campus Solutions in the coming months as the project concept is advanced and finalized. TWU expects to recommend the final project scope to its Board of Regents in November and construction is anticipated to commence in February 2018 in preparation for August 2019 occupancy. TWU’s first major housing development since the opening of the Lowry Woods Community in 2005, the Residential Village Project will be east of Bell Avenue with the dining facility directly north of TWU’s Pioneer Hall athletic facility and the housing facilities on the site of the existing soccer field. The soccer field will be relocated as part of the project. On November 15, 2016, TWU publicly issued a request for proposals (RFP). TWU and its development advisor, Brailsford & Dunlavey, structured the RFP to identify private developers with the best qualifications, experience, financial capacity and proven track records of executing similar projects. TWU received eight proposals from nationally recognized firms and earlier this year the Balfour Beatty team submitted a final proposal that was subsequently selected as the preferred development partner.